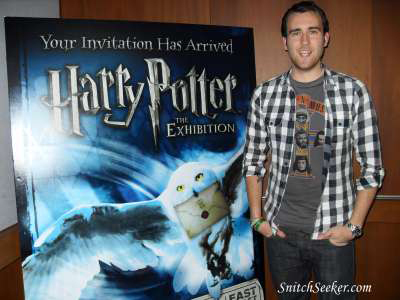 HollywoodNews.com: Matthew Lewis was on hand earlier this week to announce that Seattle would be the final stop in the traveling tour known as Harry Potter: The Exhibition. The exhibit is currently in Toronto, and will makes its way back to the States to reside at the Pacific Science Center in Seattle from October 23 until January 30, 2011. Hundreds of costumes and props from all eight movies are part of the 10,000 square-feet exhibition. During the announcement, a couple of costumes were brought onstage that Lewis himself are very familiar with: his Hogwarts uniform from the first film, Harry Potter and the Sorcerer’s Stone, and an outfit he wears in the final films, Harry Potter and the Deathly Hallows. Lewis spoke with Blast Magazine about his character, saying that Neville “has got this amazing loyalty and big heart”, which fans of the series are sure to agree with. He also stated that if he could choose one item he could have from the exhibit, he’d like to have his uniform robes from Sorcerer’s Stone. Information for Harry Potter: The Exhibition can be found on the official website.